I Love YARN Day, the perfect time to Warm Up America! Finished block should measure 7" by 9"
Row 2: * (K1, wyif sl 5) * Repeat across row, k1. Row 6: K3 * with right needle go under strand slipped in Row 2, k1 and slip the strand over the k1, K5* repeat across row, k3. Row 8: WYIF sl 3, * wyib k1, wyif, sl 5* repeat across row k1, wyif sl 3. 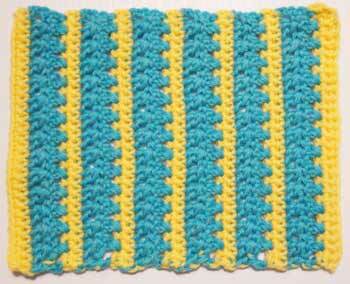 Row 12: With right needle go under the 1st strand from Row 8, k1, * k5, go under the 5 slipped strands, k1* across row. • 2 skeins of contrasting colors medium-weight yarn (noted A and B in directions). • Size hook recommended for the yarn. • Yarn needle for finishing ends. 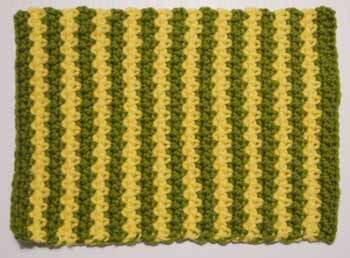 Pattern: This pattern stitch requires an even number of stitches. Finished measurements: 7" by 9"
Colors are changed at the end of the 2nd rows of each color. Do not cut yarn when changing, just drop and pick up the previous one. Yarns may be twisted around each other for a neater edge but will be in the seam or edging. With A chain 29 sts for the foundation row. Row 1: Single crochet in 2nd chain from hook, and in every chain for 28 stitches, chain 1, turn. yarn B and complete the last stitch, chain 3, turn. X)*, repeat from *, end with double crochet in top of the chain 3 turn chain, chain 3, turn. 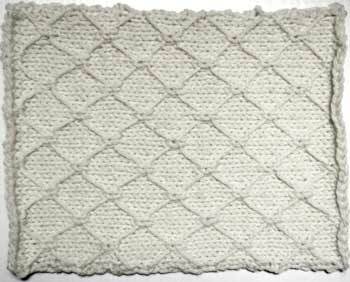 Row 5: Single crochet in each stitch to the end of the row, chain 3, turn. With yarn A chain 32 for foundation chain. repeat from * to the end of the chain for 31 stitches, chain 1, turn. Row 2: Single crochet in first single crochet in the row below, *chain 1, skip 1 stitch, single crochet in the next stitch*, repeat from * to the last single crochet, pull a loop through the last stitch, work off with yarn B, chain 1, turn. Row 3: Repeat Row 2, but end with single crochet in same color, turn and repeat Row 2 once more for 2 rows of yarn B. Change colors at the end of the row and work 2 rows of yarn A. Repeat making 2 rows of each color or adding more colors. Repeat pattern stripes until piece measures 9" from foundation row. Fasten off yarns.